Earlier this year the epic battle for the next-gen disc technology was finally ended with Blu-ray becoming the victor. However, I’m still not convinced that a new disc technology is what the industry really needs. With high-speed internet more widely available than ever before and hard drive sizes reaching over 1TB, it only seems logical that we’ll turn to digital distribution with movies, just as we’ve done with music. Once again, Apple is making strides that will no doubt help us along that path. Apple has announced that they have worked with a number of studios (both big and small) too make sure that many movies will be available on iTunes the same day they are released on DVD. Prices for new releases will set you back $14.99, while most others will only run $9.99. I’m still not ready to dump my DVD catalog and go all digital, but I really do think that this is the future. I agree with you there is only one problem. iTunes doesn’t allow you to download HD content unless you use an apple TV. 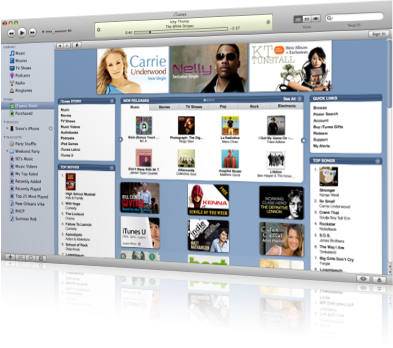 Without HD content available on iTunes consumers are going to find another alternative that allows download of HD content. I personally just sold my PS3 blu-ray because I want to stop messing with disks and just download movies now.